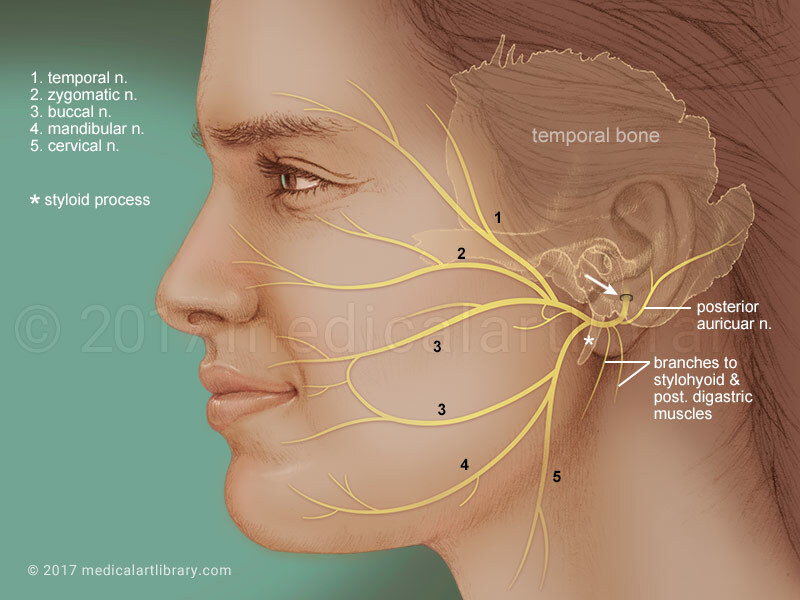 This illustration depicts the main motor branches of the facial nerve that control the mimetic muscles of the face, called the “muscles of expression”. 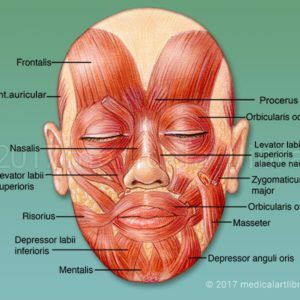 These are the superficial muscles around the eye, nose, mouth, ear, forehead, scalp and the platysma in the neck. The facial nerve is the seventh cranial nerve, and has two roots. A large motor root, and a much smaller sensory and parasympathetic root. The smaller root contains sensory fibers for taste, sensation in parts of the ear, throat and palate, and parasympathetic fibers which control the various secretory glands in the face, such as the salivary and tear duct glands. The facial nerve also supplies the stylohyoid, the posterior belly of the digastric muscles and the smallest muscle in the body- the stapedius, which controls the stapes of the middle ear. As it exits the stylomastoid foramen (arrow) in the temporal bone the facial nerve gives off a small posterior auricular branch. • The frontalis muscle of the forehead lifts the eyebrows. • The anterior and superior auricular muscles which move the ear forward and superiorly. • The Corrugator muscle on the brow, draws the eyebrow downward and medially, producing the vertical wrinkle on the forehead at the bridge of the nose. • The procerus pulls the skin between the eyebrows downward, assists in flaring the nostrils and helps create an angry expression. • The temporal branches assist the zygomatic branches with the obicularis oculi, which closes the eyelids and contracts the skin around the eyes. • The zygomaticus major elevates the corners of the mouth for smiling. • The zyomaticus minor, levator labii elevate the upper lip. • The levator labii superioris alaeque nasi dilates the nostril and elevates the upper lip, enabling one to snarl. 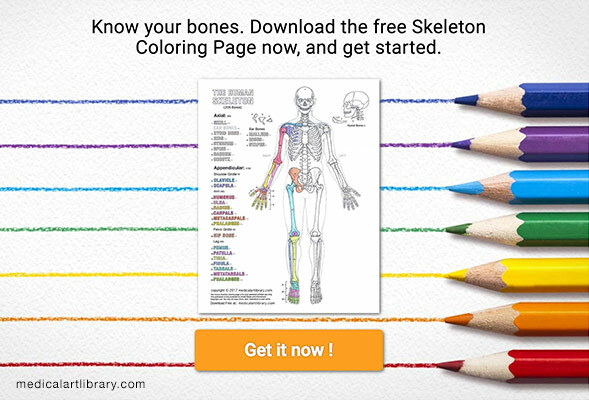 • The risorius and levator angulii oris are muscles that assist in smiling. • The orbicularis encircles the mouth, closes and puckers the lips and is sometimes called the kissing muscle. • The nasalis compresses the bridge of the nose and the nostrils. • The buccal branches also assist the mandibular branches in pulling the mouth downwards for a frown, by the depressor anguli oris, and pulling the lower lip down with the depressor labii inferioris. • The mentalis pulls the skin on the chin upwards. • This division supplies the platysma muscle of the neck, also a “frowning” muscle. The facial nerve is the nerve that is involved in Bell’s palsy.